A few weeks ago, BYT featured a holiday place setting guide with inspiring table arrangements by local favorites Mutiny DC, Holley Simmons, and Panda Head. 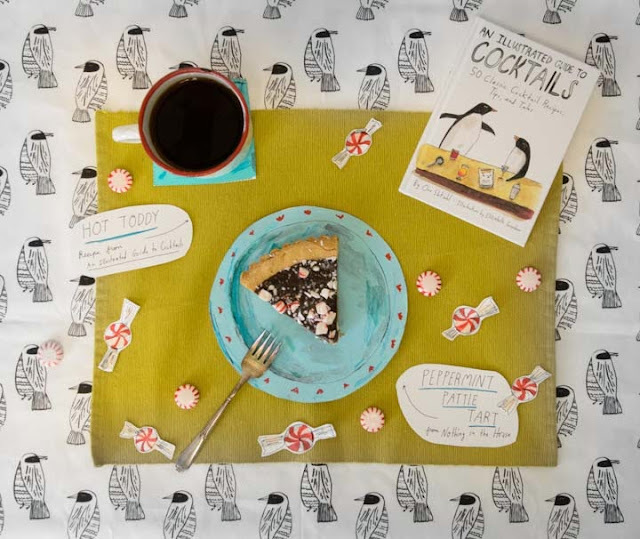 Pie Almanac illustrator and good pal Elizabeth Graeber created this fun 'n' fanciful part-illustrated part-real dessert spread featuring her An Illustrated Guide To Cocktails and Nothing-in-the-House's Peppermint Pattie Tart! You can find the recipe for the tart on the blog here as well as in my recent story for NPR's Kitchen Window, "Get Freshly Minted This Holiday Season," which also includes recipes for making your own mint extract and Mint Julep Hot Chocolate.